The horizontal boards are there just for effect. To break ask up the vertical lines. I have no idea why some of my posts appear twice. It's happened a couple of times lately. H�kan, I really like the appearance of your sawmill, and having looked at a couple of photos that popped out of Pandora's box, your roof looks very appropriate for a small sawmill like yours. As far as the FSM models go, I'll bet everything that shows up in a model has a prototype, but perhaps not with the frequency that they appear in the kits. But every kit manufacturer has typical features they like, which tend to be used and reused from one kit to the next. I'm looking forward to seeing the mill in the scene you're creating. Thanks Bob and Mike! Next is a tuff one as I need to raise the surface of my pond. It came out way to low. You could make a deeper, dark layer in the pond, by tinting the surface of the lower level, then pouring a second layer of pond on top. This sort of thing happens in cold areas, where the lower depths of the pond stay cold, but the surface heats from the sun. It creates a temperature inversion which creates the appearance of two separate ponds within one. We had a farm pond on what had been an auxiliary military airfield during WWII. We used it for irrigation for our crops, and the water down about ten feet was very cold, but at the surface very pleasant. This inversion created a visible layer barrier between the deeper cold, and surface warmer layers of water. Thanks Horse, that is an idea. I'm thinking on going with the suggested Envirotex or if I can find it Magic Water so that could be possible. I have been thinking on the idea to make a dam and I'm going for that. I'll have the gate near the narrow cove and let the water pass through a culvert below the track. I didn't see the gate you suggested but I have found some photos on the Internet that has the look I'm after. I'll make it a little more substantial as it will be pounded and abused by logs and debris. On culverts. What is feasible to have? A stone culvert feels a little to luxurious so I'm thinking on a timber one. Ideas would be much appreciated. 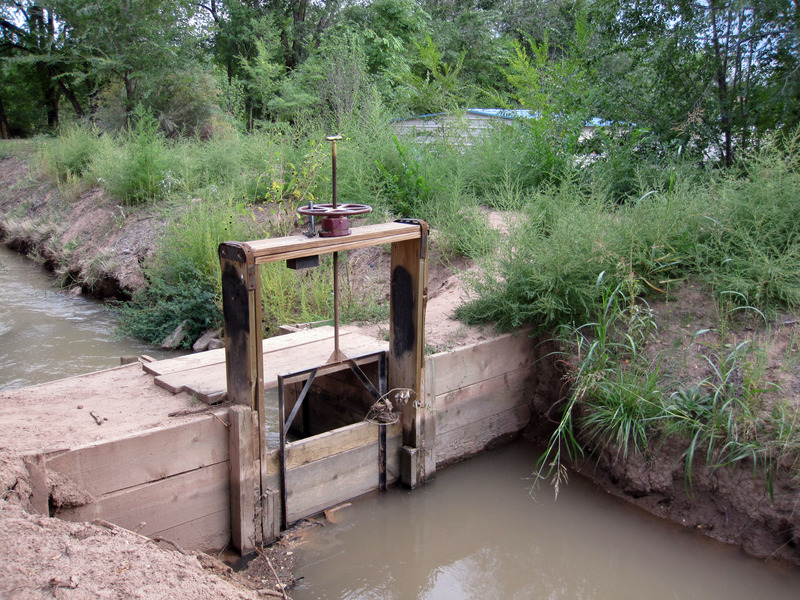 The type of sluice gate you have pictured is exactly the type I was referring to. As to the wooden culverts, I like both designs, but for your purposes I think the squared off heavy timber design might work better for under your right of way, as it would take more abuse. I suspect that the weight of trains passing over the rounded one, would cause it to collapse. That design might be better in town for storm water management, or some other location where traffic passing over it would be lighter. 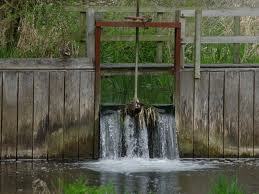 That a good example of a sluice gate. The dams themselves could be just pilled up dirt or wood planks laid out just like your mill's roof being supported by half trusses but not as high of course. Your barrel makers could handle the job. Bob is correct, the round style culvert is basically a water tower laid on it side, and used as a pipe. Coopers (barrel makers) would be the perfect craftsman for that job, but I still think that the square style will last longer, and be much stronger, and that would be a job for carpenters, not coopers. Well, the square 'tube' would definitely not be stronger. A staved barrel would tend to expand as the wood swelled. The iron bands would hold the barrel staves together, resulting in a tighter fit. A rectangular shape would have none of these advantages and would be substantially weaker at the corner. Still, "there's a prototype for everything" and either square or round culverts would work just fine. Thanks guys! The round one would be great looking but I agree that the square one looks sturdier so I'll go for that one. I hope to raise the surface this weekend using a white foam sheet on which I'll put something to avoid it from gassing. The square one would be simpler carpentry, more wood and less iron. Not a problem near a sawmill. I would agree with your structural assessment under normal circumstances, however in this particular application, I believe that the square culvert would be stronger as a structure passing under the right of way. I believe that under the ROW, the round one would flex in a collapsing manner, but that could cause upper level boards, not frequently kept wet, thus swelling as you suggest, to break out of the structure, making the overall structure weaker in the short run. Yes, the square structure is less forgiving, but in a set location such as passing under the tracks, the embankments on each end will add the support to reduce the damage you refer to. Therefore, I believe that the square structure is better in this specific application. Thanks for the suggestion James. I could not find Envirotex here but I found another brand that I'll try. It is in the mail so hopefully I get it next week. In the meantime I have raised the floor with a piece of thick Masonite. I didn't raise it as much as previous suggested as my retaining walls would then be nearly under water. In the picture below I have marked where the gate will be. 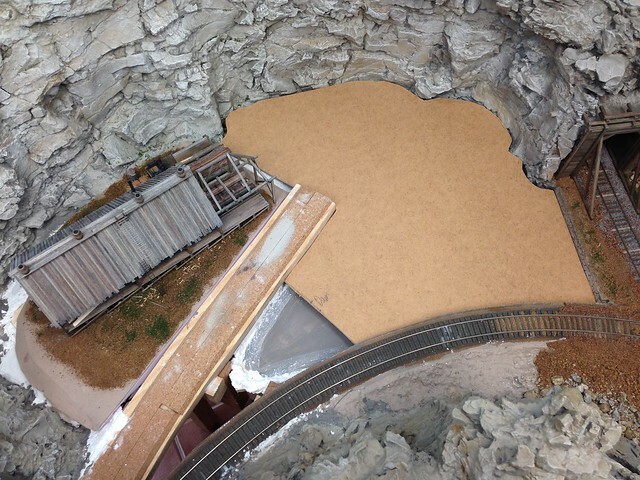 The culvert will be at the other side (bottom of photo). Thanks James, Horse and Dave for the input on the culverts. I think I'm going for a square one. 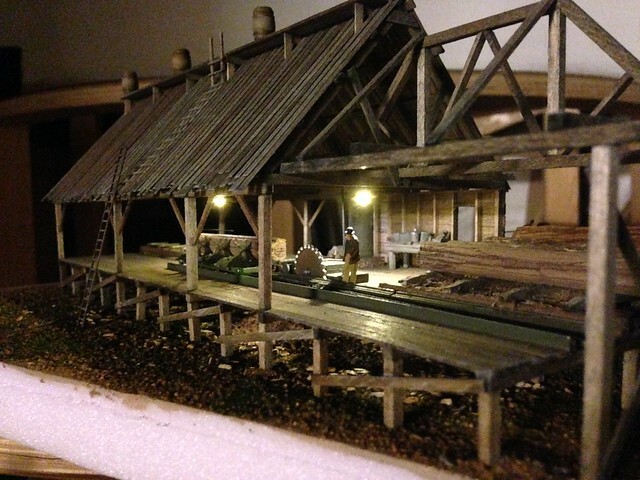 I tried placed the sawmill on the layout and it was hard to see the interior under the layout lights. So I installed some small LEDs with Grandt line lampshades to light the interior. The install was not the easiest to do as everything already was assembled but I hid the thin wire from view so it is not that noticeable. The LEDs are golden whites which I'm sorry to say go a little to the greenish direction. But now they are installed and have to represent some storm lanterns or equivalent as the era I'm modeling didn't have electrical lights. The scene composition and lighting inside that sawmill are phenomenal! If you're concerned about a greenish hue shift, you could try adding a transparent wash of a warmer yellow-orange color over the bulbs to give the light more of a fiery glow.